The Ferrari P4 of Scarfiotti/Parkes makes a pit stop during the 1967 Le Mans 24 Hours. Open Edition Print, reproduced from an original painting by Michael Turner. Since the first race in 1923, the Le Mans 24-Hours has become one of the most prestigious races on the calendar and seen many classic battles between some of the most evocative names in racing. 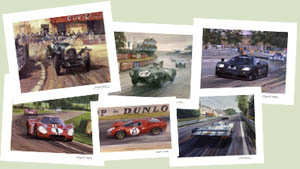 Michael and Graham Turner have visited Le Mans many times and it has inspired a large number of paintings. CLICK HERE to see all those that are available as prints from Studio 88.